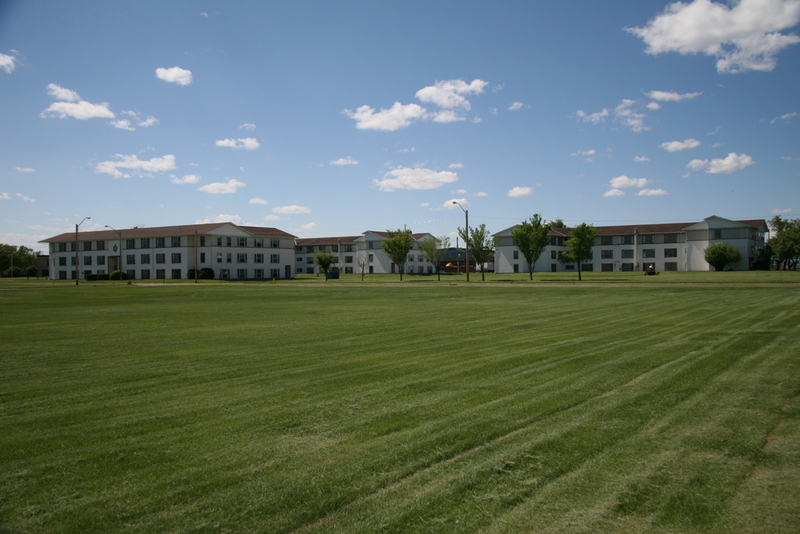 Harvard Park is located on over 90 acres of well-maintained, mature landscaping and approximately 395,000 square feet of buildings in various sizes and configurations. Thus the Centre is able to maximize its potential uses and has accommodated hundreds of groups and thousands of people since 1995. The property is maintained by a dedicated maintenance and housekeeping staff who are constantly upgrading and improving the facility. In 1939, land was purchased and prepared for a future airfield. Construction began on what was to become R.A.F. No. 36 Service Flying Training School, one of several flying schools across Canada, as part of the British Commonwealth Air Training Plan. This was an agreement with Britain to train Commonwealth pilots and a key component in Canada's contribution to World War II. By late 1940, 31 buildings and 5 large double hangers had been built. It officially opened in 1941 when a train brought in 600 officers and men, mostly from Britain. The facility started with 20 training aircrafts as well as others in reserve. The trainers were primarily twin-engined Airspeed Oxfords. Eventually there were close to 200 Oxford trainers on site and well over 1,200 pilots graduated. The air training school and airfield closed in 1944 with only a military radio station remaining. Much of the electronic equipment was destroyed in 1945 and, except for the hangars; most of the buildings were demolished. The base started preparing to re-open in 1951 as a #4 Flying Training School for NATO and the actual training started in 1953. In 1954, a maintenance hangar was destroyed in a multi-million dollar fire. During this time the primary training aircrafts were Harvard planes. Houses, duplexes and townhouses were built in 1954 adjacent to the base for officers and their families. The new residential area was called Mynarski Park (named after P/O Andrew Charles Muynarski, one of the R.C.A.F. 's two Victoria Cross recipients). In the same year, Anderson of Craigmyle School opened (Grades 1-8) named after the Anderson family of the area who had lost 3 sons in the War. The base was named CFB Penhold in 1966 as a result of unification of the armed forces. Leadership and radar schools operated from 1973 to 1986. A summer cadet camp has operated in some form since the Second World War and to this day, space is leased during the summer for various programs that involve up to 1,700 cadets. In 1996 Harvard Park Business Centre Ltd, a privately owned company, acquired the property from the federal government and continues to lease the property to the Department of National Defence for the summer cadet program. The Hamlet of Springbrook was created in 1995 with the closure of CFB Penhold and encompasses the Red Deer Regional Airport, Harvard Park, over 250 heritage homes plus new homes and businesses starting up every year. Though Springbrook is a new town, it has a lot of history! In the past, Harvard Park has housed, trained and held events for clients in many business sectors, including, Military, Police / Security, Government, Education, Oil & Gas, etc. A "staging" location for individuals and equipment. Lodging and accommodation (up to 1,000 people). Efficient air express and passenger flights. Proximity to existing and future clients. A variety of potential leases. The "turnkey" facilities at Harvard Park cannot likely be equaled in any other location in the Province of Alberta. This is especially true if a corporation or a consortium of companies require a large facility with management in place.